We witnessed how our games trigger all kinds of emotions, as our booth attendees got excited, happy, curious, proud, anxious, and greedy while playing. 10 minutes into the first day, we had 4 people walk into the booth, and we never looked back for almost 3 ½ hours. We had 3 games people could play in our booth – and with those choices, nearly everyone had a game they wanted to play. Once we had attendees in our booth playing our games and talking with us, other show attendees were curious to see what the fuss was about. A crowd truly draws a crowd, and the games got the crowd started. 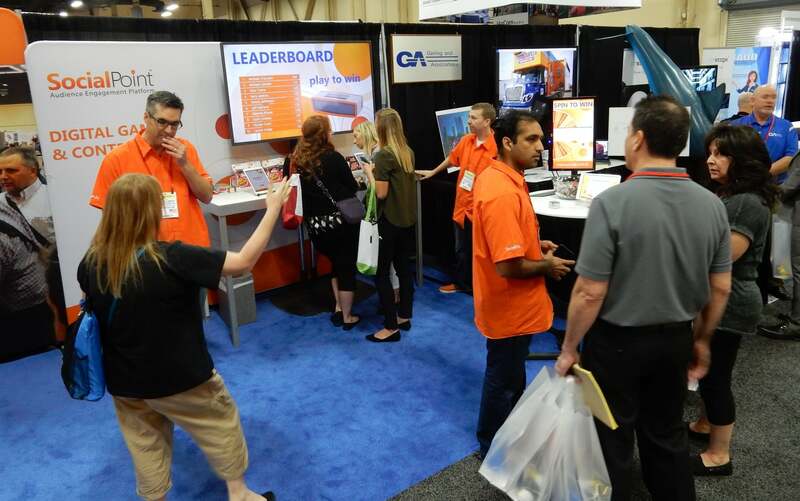 Our Interactive Trade Show Games Got Attendees Interacting! People gladly filled out few qualifying questions we asked on the forms to spin the Virtual Prize Wheel and win a prize, be it small, medium, or large in value. And almost everyone checked off the boxes asking to be on our newsletter and to get more info on our products. Many people who played the Challenge Bar Trivia Game stayed for a long time, all the while learning about our products as they answered questions about them. When they got to a question they did not know the answer to, then they would ask a SocialPoint booth staffer for guidance, and another relationship was started. We had a 60-inch flat screen monitor with the word “Leaderboard” in big letters and the list of current trivia game leaders as an attention-getter. Show attendees stopped because they were curious who was on the Leaderboard, and how they themselves could get on it. 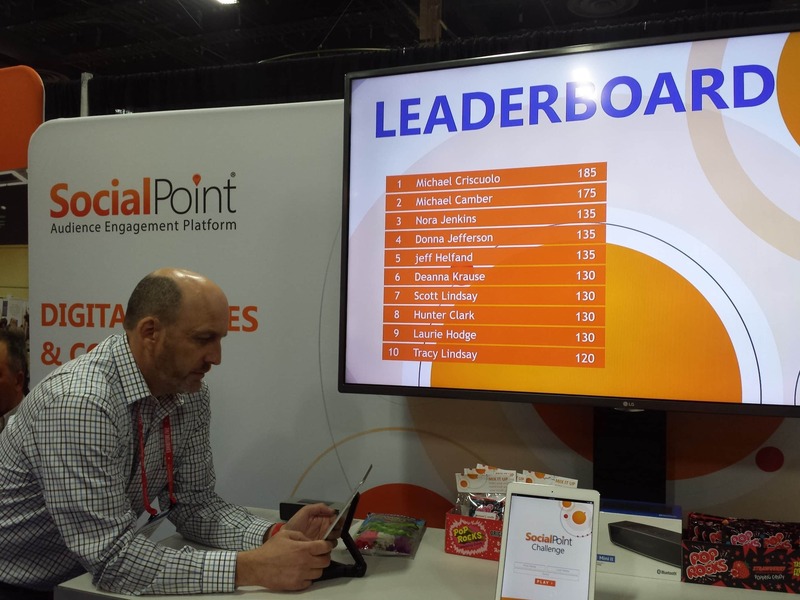 We witnessed several attendees taking pictures of their name on the leaderboard, and attendees come back for multiple visits to see if they still were on the Leaderboard. Our eventual Challenge Bar Trivia winner actually came back three times. Our neighboring exhibitors said to us, “Wow, your booth was always full!” And on the final day of the show, a fellow exhibitor came into our booth and said, “At this show, I had just a static backwall and not enough traffic. Your booth was always busy. I want to get your Virtual Prize Wheel for the show I have in 9 days.” We worked out the deal right then. 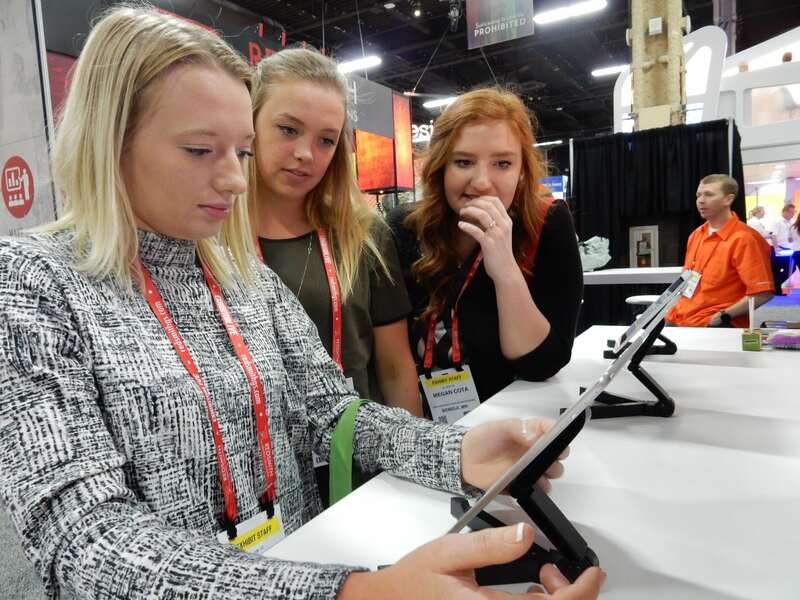 We also experienced high interest from companies that wanted to join our Partner Program, as they experienced themselves how our interactive games and contests can help their clients to get more booth traffic and leads at their trade shows. Overall, we exceeded our goal for leads by almost 50%, and our goal for qualified leads by over 200%! It was great to experience for ourselves just how well our own games do exactly what they are intended to do!